My Easter flight session: 28 flights. At about flight 18: a father and son wanted a still photo posed with son with me under the Alpha 210. At flight 28: Carl wanted his girlfriend to have a still photo posing under the Alpha 210 with me. Those photos will be shared with their friends. At about flight 15 in a messy mogul crosswind landing: strained right forearm muscle-tendon. Pleasant SW and W wind, not soarable, but enough to have assisted carrybacks. Session: 2 p.m. to 6 p.m. for HG followed by some warm-down string kiting until 7:15 sunset. Traffic at 12:55 was favorable; same for car traffic return; faster than regular: about 45 min drive each way. The parking lot was rented out to a movie company; hundreds of cars; security saved a couple of spots near the hang gliding trailer; I was given "OK" to use one of the spots. Pelicans, seagulls, other smaller sea birds, and two large geese spotted views. Numbers from top to bottom: temperature, cloudiness, Dew point temperature, relative humidity, wind direction and wind speed. It seems SW may be better than W.
I'm assuming that Windsports was closed for Easter. I was wondering if that might happen. Good for you Joe, I wish I could have joined you there. I also need to go there when Windsports is open so I can deliver their repaired wheels. Clarification, Frank. Thanks. But my diary note of "April 2, 2018" was not Sunday, Easter proper, but Monday; Monday, day after Easter is for me within the "50 days of Easter celebration: "Eastertide""; hence, "My Easter flight session". I do not know whether or not WS was open on Easter Sunday or not. My van is in the shop and it should be ready soon so I can rejoin you in enjoying the fruits of freedom that we've earned together. Thanks to you and Frank and everyone else who's made this possible. I took delivery of my 2018 Honda Ridgeline last Wednesday (3/28), fantastic vehicle However, the roof rack had to be ordered after the truck was purchased (I tried to get them to order it while waiting for the truck - but "no dice" on that). The Honda dealership service dept will be installing my roof rack on my new Ridgeline this Thursday. Then I will have to check the height of my front and rear glider supports and modify them if it isn't the same as the previous model. So, not sure at this point when I will be able to transport my Condors but possibly by next open flying days at Dockweiler. Also depends on the hospital release date for my wife and how well she is doing. Best wishes on all points, Frank! Dockweiler with Alpha 210: 2 pm. to 6:00 pm session: 40 flights. Then 6:15 p to 7:00 pm. : 6 more flights. Total: 46 flights. Wind was a bit better than yesterday. 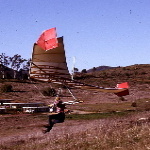 About 15 of the flights were one-way ridge soaring. Condor would have given some soaring figure 8s. "Randy" may take lessons soon. "Security Guard of parking for Warner Brothers "Joe" may take lessons soon. I think Greg's spirit has found a new home. As much as it would pain you to rejoin USHPA, that's what I think you should do. Then you can fly every day and truly become the spirit of flight that you've always been destined to be. Life is short. Live it with joy. I am so lucky to have known you Joe. Joe, it's good to hear that you are making good use of my old/new Alpha. Wish I had been there with the 330. 1. I'm aiming to hang glide nearly every day somewhere, somehow. 2. 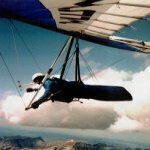 It is a joy being a member of the open-and-free recreational hang gliding community. 3. 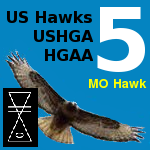 It would not be simple pain to join the repugnant u$hPa, but a spiritual suicide; I cannot have integrity and support an org that is staying blind unabashedly to the ravages of the PDMC while sucking life out of their hang gliding faction (in part by an abuse of expelling one of their finest members Bob Kuczewski). That org would surely expel me if I joined them! 4. Ask the logical question: "Does one find WS closed on Wednesday? " Go there at 7 a.m. in the morning of a Wednesday and observe that WS is closed; that means that on that Wednesday it is true that one can find WS closed. WS is both open and closed on Wednesdays. 5. Safe-Splat for downslope-street braking is yet challenging, but a creative joyful challenge. I'm hoping you remember me. We met in person at the Otto meet in 2016 (and maybe 2015?) and I remember telling you that my first vario was a Colver. Well, I wanted to wish your wife the best toward a speedy recovery. My, now 87 year old, mother had a mild stroke back in 2000. It occurred during a "routine" operation to remove a small benign brain tumor. Well, she's still plugging away but I've witnessed the troubles involved in recovery, as well as the long term effects. From that perspective I wish the best for you too because I'm sure your wife will need some help and support from you. PS - If you don't remember me, just ask Bob who I am.